Chef Jack is the leader of the Rebel Chefs, and Chase and Kayla's father. He was trained by Oslo and has mastered all the different cuisines in the world. 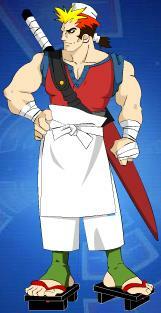 He also took on a disguise and called himself Chef John, a rebel chef trainer and hot pepper agent who appears where Chase is. During a battle against Rose Marinade's Dimsumthin' Dragons, his mask broke, revealing his true identity to be Chef Jack!